In 1806, the Bowman's of Richmond, NSW flew a flag to celebrate the English victory at Trafalgar. The amazing thing about this was, the Bowman flag looks very similar to the modern coat of arms. It has a Kangaroo and Emu holding up a shield adorned with heraldry. Kangaroos have long been a 'distinctly' Australian image but how did they work their way into becoming the widely accepted flying kangaroo in the air force's roundel? One of the earliest ones we know about is a white kangaroo painted on the nose of an aircraft in the French Foreign Legion flown by Oswald Watt during 1915. 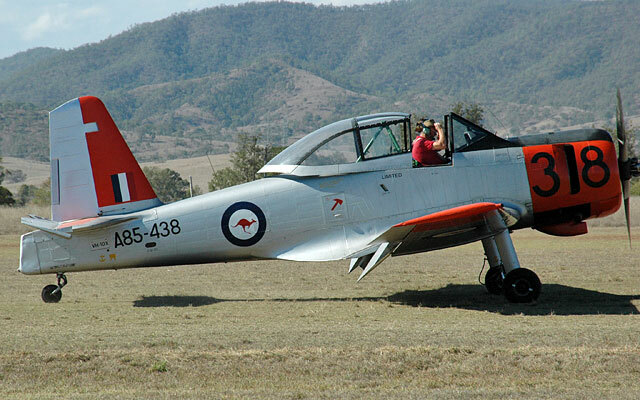 The aircraft also carried 'Advance Australia" in wobbly hand-written letters. Watt was born in England and emigrated to Australia where he became a successful merchant and grazier. When aviation started appearing, he was off for another adventure, and sailed to Egypt where he flew a Bleriot before moving to Bleriot's own aerodrome in France and flying there. When war broke out he didn't think Britain was going to get involved so he joined the foreign legion. In 1916 he transferred to the Australian Flying Corps as a flight commander with No.1 Sqn AFC where there is no record of kangaroos appearing on the aircraft. When he took command of No.2 Sqn AFC soon after, their Sopwith Strutters appeared with large white crouching kangaroos on them. Later Richard Howard wrote home about red kangaroos being on their DH5 aircraft though no photographic evidence has appeared to support it. In any case, their assigned squadron marking in France was a thin white stripe in keeping with the Royal Flying Corps (British) markings which squashed any Australian imagery surviving the cross-channel trip. From left to right: Watt's Farman, Sopwith Pup and Strutter of 6 Sqn AFC. This state of affairs didn't last long; when the squadron received SE5a aircraft the squadron marking was changed to a white boomerang. Their sister squadron, 4 Sqn AFC, who flew alongside them, also adopted the boomerang. This was too distinctive for the British, and in the March offensive of 1918 they jumbled the squadron markings to try and confuse the Germans - which left the two Australian squadrons with a boring old white stripe again. Watt had by this time been posted to start the Australian Flying Corps training operations in England where a wing and four squadrons were established. There was a new explosion of colour and markings with boomerangs, emus and kangaroos appearing. The Fighting Instructor's aircraft, which was the Top Gun training of the time, were in whites, reds and chequered markings to stand out. 6 Sqn was the main user of the kangaroo marking, which was a standing white kangaroo on a red stripe. 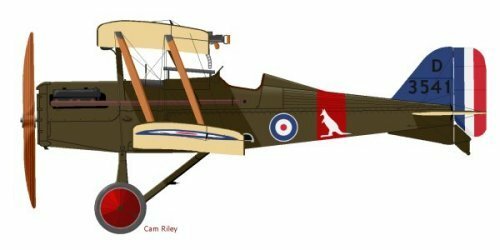 After WWI kangaroo imagery was absent until 1941 when Australian squadrons found themselves at aerodromes with British squadrons and discovered their aircraft looked exactly the same as the British ones. We couldn't be having that! The best known result of this situation is the Boxing Matilda flag that became synonymous with Australian sport after the 1984 America's Cup win. When 21 Sqn RAAF wanted to 'Australian up' their aircraft they painted boxing kangaroos on them - this is the origin of that flag. Boxing Matilda is a pervasive image, especially in a martial environment, as it represents the fighting spirit, and it appeared on Australian aircraft in the Pacific, Middle East and Europe. Even today the flag is used side by side with the Blue Ensign in ADF deployments, an example of the strength of the flag's imagery, but also the weakness of the Blue Ensign. Up until 1956 the Australian air force used the British roundel though during WWII in the Pacific theatre, they dropped the red circle as ground gunners and the United States Navy had an unhealthy habit of shooting at anything with red on it. In the Middle East the South Africans had started putting an orange centre in their roundel, and then replaced it with an orange springbok which they used in the Korean war as well. In this style, Australia decided to use a red kangaroo in the roundel. Initially some DHC Beavers flew around with a standing kangaroo, not unlike the one used by 6 Sqn AFC. This was soon standardised into the bounding kangaroo that is used today. 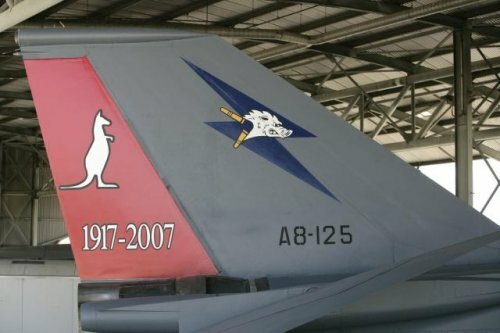 6 Sqn is currently celebrating their 90th Anniversary and have painted the tail of one of their F111s with a red rudder and the early style kangaroo for the Avalon Airshow. A nice reminder of how the kangaroo came to be synonymous with Australian aviation. 6 Sqn RAAF's F111 in 90th anniversary markings with red rudder and white kangaroo. Image courtesy of 6 Sqn RAAF.